Trailing 3-2 early in the third period of Game 3, the Buffalo Sabres earned 1:15 of 5-on-3 time thanks to a Nikolay Zherdev hold and a Darroll Powe cross-checking call. But just like the Flyers’ Game 1 two-man advantage, for the Sabres, it was the turning point of the contest. And just like for the Flyers, not converting proved costly. Anyone reading the event summary for the Flyers’ 7-4 victory over the Pittsburgh Penguins Thursday night, noticed an odd number next to defenseman Kimmo Timonen’s name — 15:06 of ice time. CSNphilly.com is reporting that back spasms limited Timonen in the third period, forcing Braydon Coburn to (try and) pick up the slack. Timonen did skate on Friday and will be in the lineup Saturday, when the Flyers take on Tampa Bay. Mark Malinowski of The Hockey News does a weekly feature in which he interviews a hockey personality, asking him personal and off-ice questions. This week it was Flyers’ defenseman Braydon Coburn’s turn. Among the many questions answered by Braydon, other then having the nicknames Marmaduke and Seabiscuit, one of the strangest was about his funniest hockey moment. It involved a random coach being sliced open and needing stitches. What a sicko. 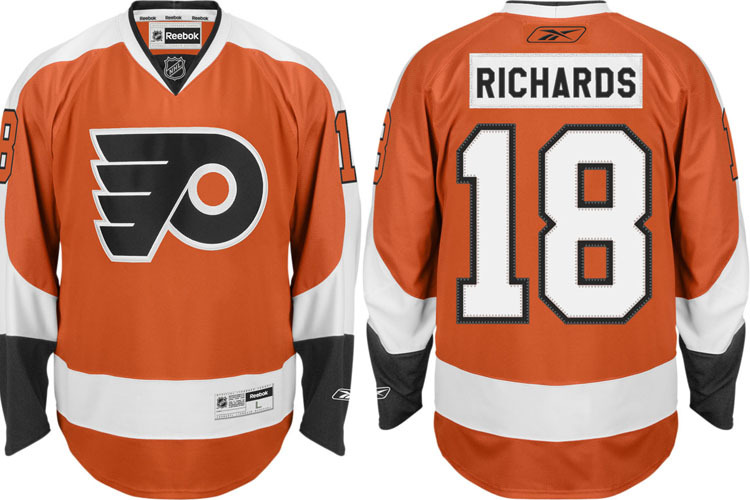 He also drives a black Audi s5 and loves the Flyers’ new orange jerseys. Kid’s got taste. After submitting to a review from the NHL’s disciplinary office, the NHL has came to the conclusion that Flyers’ defenseman Braydon Coburn’s punch to Nik Antropov in the second period of Sunday’s 4-1 Flyers’ loss, was not worthy of a suspension. Coburn received a five-minute major and game misconduct for what the ref deemed as an attempt to injure. 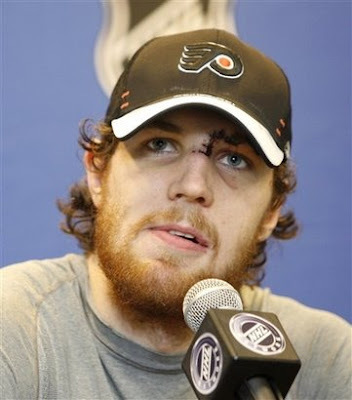 With five seconds remaining in the second period of Sunday’s 4-1 loss to the New York Rangers, Flyers’ defenseman Braydon Coburn took a punch at the head Rangers’ forward Nik Antropov, sending him sprawling on the ice clutching his face in his hands. What appeared to be just a punch to the head behind the play, turned into a five minute major and matching game misconduct because Coburn was still clutching his stick at the time, making the play look like an intent to injure.